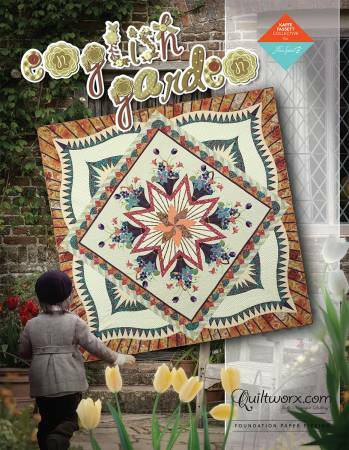 The English Garden design was created using a series of mixer blocks from the Cattail Queen Mixer series designed by Judy and Bradley Niemeyer, from Quiltworx.com. It includes four sections referred to as Groups A, B, C and D and these Group sizes have been standardized so that you can use interchangeable blocks in each space. The Units selected for this quilt were named Basket Star, Flower Basket, Satin and Lace Border, and the Princess Tiara Queen Expansion package. If you have purchased this pattern, these groups have been combined into one pattern and have also been adapted for a rainbow colorway.